A beef roast, cut from the rib section, with the ribs left attached to the meat. 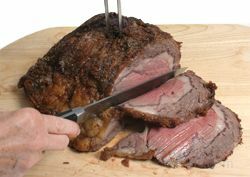 The standing rib roast may be purchased as a full rib roast, which is ribs 6 through 12, but more often it is split and sold as two different roasts. 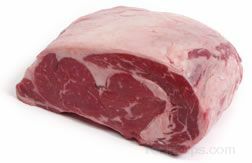 One of the roasts, known as the first cut or small end rib roast, contains ribs 9 or 10 through 12 and is next to the loin. 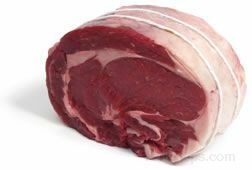 The other roast, known as the second cut or large end rib roast contains ribs 6 through 8 or 9 and is next to the chuck primal. It is very tender, but because of its proximity to the chuck, it is not quite as tender as the small end rib roast. The standing rib roast is cooked standing on its rack of ribs with the fatty side up. 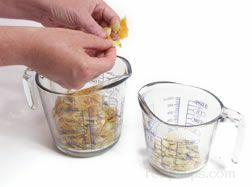 During the cooking process, the melting fat bastes the roast keeping it juicy, flavorful, and tender. 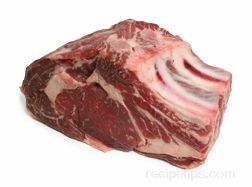 The bones of the standing rib roast also contribute to the flavor, making it tastier than a rib roast without the bones (boneless rolled rib roast).